It’s somewhat ironic that I’m working through the Druidic curriculum on Fire at the moment, because I’m doing quite a large amount of work in wood. It’s strange, of course, because wood is flammable, and is not really thought of as a permanent material; fire seems more connected with alchemy and metal work. And yet, here I am: working in wood. 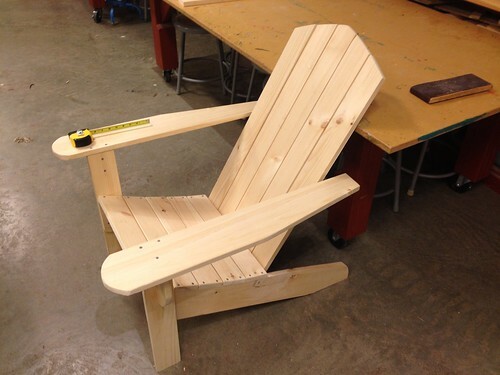 The Adirondack chair has really served as an initiation — it got me comfortable sawing and measuring; and now you couldn’t keep me out of the sawdust if you tried. Above, you’ll see the puppet armature doing a semblance of a walk. This will be part of an ‘army’ of puppets walking across the stage as part of the spring musical. That’s not all of it, of course; we’ll have to make costumes for it. And the costumes will have to fit. That will be rather difficult, of course; I’m good at sewing, but I’m no puppet tailor. Much work to be done here. All the same, the basics of the design are set. 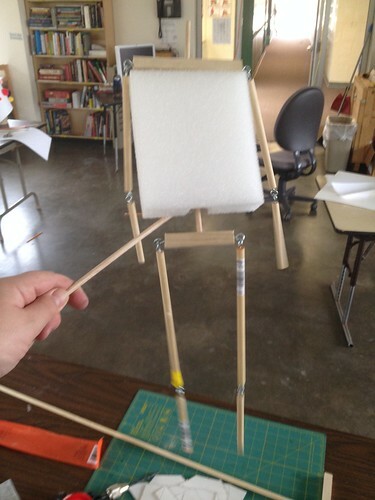 The puppet has a stick for a head, some jointed arms and legs, and a block attached to its spine (a wooden dowel) for the puppeteer’s handling-pole. The legs are similarly jointed. Basically, the whole thing is styrofoam, basswood and balsa wood doweling, and some steel eye-screws. Not much to work with. But enough. Once we dress it up in a uniform made of red and black felt, and a tennis ball head, and some bits of gold braid hot-glued into place, it will be hard to pretend it isn’t a tiny soldier in a 19th century ‘redcoat’ uniform. It will be somewhat impressive. There’s likely to be a good outcome on this one. I’m off to a good start. And then there’s the little magnet toy. 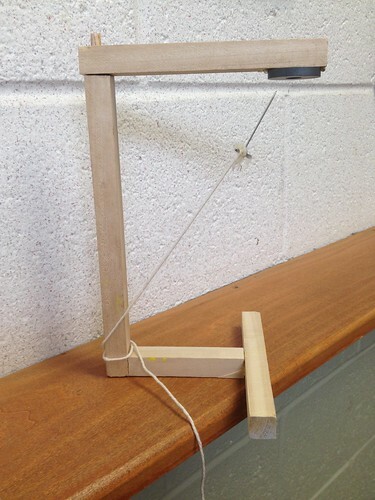 This is a funky little wooden frame that supports a magnet above the ground on a swing arm; and at the base is a string with a needle tied and glued to it. We made four of these yesterday in the Design Lab — and the kids had a blast. 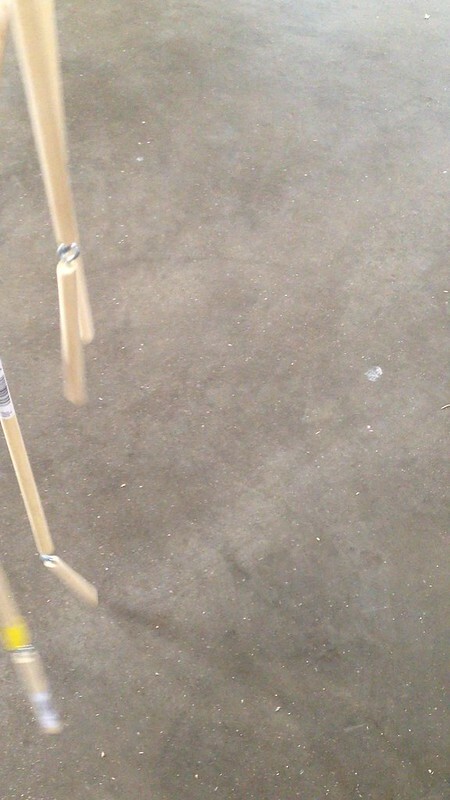 From their perspective, they were making magnetic toys. From my perspective, they were safely learning to use drills, saws, C-clamps, sanding tools, a utility knife, and a hot-glue gun. Pretty impressive, altogether. I was pleased. The thing that’s particularly useful about these two tiny toys is that they teach complicated tool use, and interesting things about the human body or about magnetism, for not a lot of money. They present really powerful learning opportunities for not a lot of money; and my three students continued to refine and develop these toys far beyond what I planned on teaching — they also overstayed the end of the class by almost 40 minutes. The chair, of course, is the big project right now. I’m working on that at the Eli Whitney Museum, which has great programs for kids and at least some programs for adults (I’m saving my pennies for their hand-built kayak class!). The chair has taught me a good deal about this kind of furniture design, and I’m thrilled with what I’ve learned. But more than just learning how to make a chair, I’ve learned how to work with wood; and I have a good many ideas about the next couple of projects that I intend to build. This is going to get exciting, I’m sure. But think about that: In the space of a few months, I’ve gone from being a non-worker in wood, to a worker in wood. Sure, I built a loom with my friend Matt a few years ago. That was awesome. But it wasn’t initiatory in the same way that the chair was. It wasn’t an introduction to all of the tools of carpentry, in the same room with ten other people struggling with the same crafts and the same issues of measuring and drilling and planing and carving and chiseling. And then there was the knife handle. Wow, that was hard. I gave myself numerous blisters and almost — almost but not quite — cut myself numerous times. And then, all of a sudden, about fifteen hours into the project of making that knife handle, things … shifted. 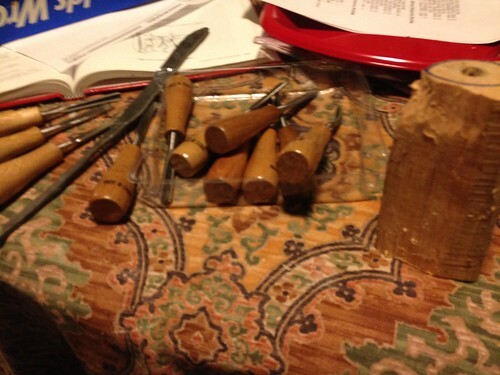 Suddenly, my hand just sort of knew which kind of chisel to use, and how deep, and when it was time to sharpen the carving tool again. I shifted from being an utter rube at the skill, to being an apprentice. Somehow, in the process of working with one material over several weeks (years if you include the loom), half a dozen skills all came together at once — how to put in screws, how to connect different pieces of wood, how to think through a larger project from beginning to end, how to frame next actions as a To Do list, how to develop my own ideas into a complete project from beginning to end. That’s design thinking. In my school’s nascent design tradition, I did research, I asked for help from experts, I brainstormed solutions to problems, I prototyped some designs, I visualized (drew) and chose (critiqued) a specific set of design parameters in several projects. I encountered problems, I named them, and I solved them (in one material, at least). Others may be farther along this curve than I am, with this or with other materials. But I’ve learned some key skills along the way — and having a process for executing the design (carrying it from raw materials to finished products, through several setbacks or difficulties), seems to give me a leg up on learning the skill. How do we design such initiatory experiences for our students, when we’re starting up Maker curriculums in our schools? How do we provide students with the key skills needed to work with paper, or with wood or with metal or with glass or with computers? How do we keep those projects from becoming static and ordinary?